Designers love their tools and processes. Many verbal battles have been fought about code or images, Photoshop or Sketch, paper or screen. And these discussions are serious. You’d think they were about whether to kill all kittens in the world. “Why don’t you name your layers?”, asks Designer A, looking in disgust at her coworker’s latest instance of Artboard Copy 05. Designer B shrugs. Designer A visibly shakes, in the throes of obsessive compulsions. 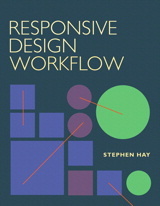 While I understand Designer A—after all, I wrote a book about a particular way of working—I often tend to side with Designer B. Here’s why. Imagine two Sketch files. Both yield the exact same static image. In our example, stakeholders don’t see the Sketch file. Developers don’t see the Sketch file. They don’t see the layers; they don’t have to deal with the layers. In this case, it doesn’t matter how the layers are named. Now imagine a relatively small design change. One designer makes a high fidelity mockup in Sketch with full spec. It takes an hour. Another designer opens the page in the browser, open the browser’s developer tools, makes some changes, and screenshots or saves the change and the dev tools CSS. It takes 10 minutes. Both communicate the same thing clearly, one takes less time. Or a high-fidelity mockup where a super-quick Invision Freehand sketch and a couple of notes will suffice. Or a hand-drawn sketch on a sheet of paper and a 5-minute sit-down with a dev. How can I communicate this clearly, through the most effective application of my time and effort? Is this an artifact or a deliverable? Will others need to use it in non-exported form? Will this need to be reusable? To what degree? The end result of a design effort, not including a product itself, is the communication of intent to those realising the production. Developers, for example. And usually non-technical stakeholders. This communication of intent, in whatever form, is your deliverable. All other side-effects leading to that deliverable are, arguably, artifacts. You could, in many cases, destroy them when you’re finished—without consequence. How many of your Sketch files are really reused by other designers? How many are ever opened again? Do you work in a deeply data-informed environment, where myriads of A/B tests mean you’ll have to rework parts of a previous mockup that are irrelevant to your design changes? Is it quicker to take a screenshot of a current screen, and overlay changes? Are you putting effort into ways of working that make you feel good, but are irrelevant to communicating your intent? Will a [quick] conversation suffice? Will a [quick] sketch suffice? Will a screenshot with annotations suffice? Will a low-fi mockup suffice? Will a hi-fi mockup suffice? I need a prototype. At what level of fidelity? Of course, ideally you’d come up with questions that fit your own circumstances. These are just examples. I get it. I do. Emacs vs vim. Gulp vs Grunt. React vs Vue. Sass vs LESS. Spaces vs tabs. (The answer is spaces.) Everybody has preferences, ways of working that are effective for them. But think critically about whether you’re solving the right problem. Those particularities of your own working style might not add much to your actual goal. Sometimes we present ourselves with the illusion that we’re doing something important. But the biggest waste of time is doing that which need not be done at all. I co-organize some popular conferences in Amsterdam with a few friends/colleagues. As the resident designer, I’m often tasked with making the name badges that everybody wears. I used to make these in Adobe InDesign, which has a mail merge function that, while kind of weird (I seemed to be required to use UTF-16 CSV files to merge with), worked pretty well. Since I switched my OS to Ubuntu a while back, I haven’t had a need for InDesign. Really, the only thing I ever used it for was for making badges. That doesn’t justify the cost to me, not only financially, but also in disk space. :-) So I’ve set out to make these badges in one of my favorite drawing tools: Inkscape. Since Inkscape is an SVG drawing program, and SVGs are text, I figured there might be some flexibility there. That flexibility and freedom have a price, though. Instead of doing everything in one GUI app, a few different programs are involved. The workflow involves using the command line. It’s not a perfect process, but it works fairly quickly and well for me. That said, feel free to laugh at my awkward process. Open your copy of InDesign now. By the time you’ve finished reading this, InDesign should be open and ready to go. Note that I’m not doing book design here; my use case is fairly simple. If print design were still my profession, I would most likely use the best software for the job. My biggest problem with this workflow is that I kept forgetting what I did the previous time. That’s the main reason for me writing this, and for a couple of people who requested it. It’s essentially documentation for me, so I don’t forget again. That said, someone else somewhere might find it useful. This is for informational purposes only, and may not work on your system. I am unable to provide any support. It’s probably best not to follow along at all if you’re not somewhat comfortable in the command line. I mainly work on a Linux machine, and this description is written from that point-of-view. Anyone following along on other systems might have to work out discrepancies or weirdness in their own environment. I draw my artwork in Inkscape. I have a CSV with attendee data. I type one command to generate a file for each badge. I type one command to combine those files into a single PDF. I send the PDF to the printer. Note that in a GUI, instead of typing a command, I would probably choose various commands from one or more menus. So, to be clear, from my perpective, this is not more work than doing this all in a GUI program. I will concede to the fact that there is more complexity in the tools I use, as you have to install three, and they might not work the same on every OS. This process assumes a Linux-like OS, and enough knowledge on your part to recognize things you might need to change to get them to work on you particular OS. Instead of InDesign (and a tool to convert a UTF-8 CSV into UTF-16), I need three tools, which I’ll describe below. These tools are freely available and don’t take up much space. The time it takes to generate the badges is not longer (and often shorter) than doing the same with commercial tools. 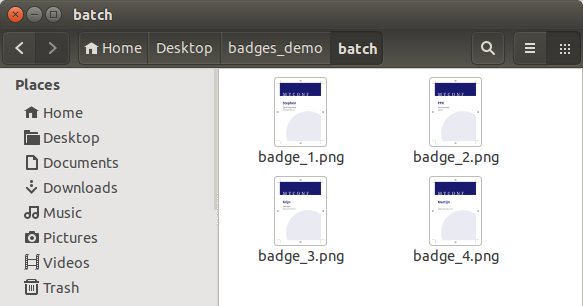 Badges are made in Inkscape, and data from CSV is merged using a Ruby gem called inkscape merge. It’s not ideal, but it works fairly well in that Inkscape can be used and I’m not locked in to a specific software vendor’s software and workflow. The process outlined here is simple and has kinks, but lots of things could be scripted to do more complex stuff, like customizing visual differences between speaker badges and attendee badges, etc. Ghostscript, to merge all the files you generated into a single PDF, if you’ve exported those files themselves as PDFs. If you’re on OS X or Linux, there’s a good chance this is already on your machine. ImageMagick (specifically `convert`), to merge all the files you generated into a single PDF, if you’ve exported those files as bitmaps, e.g. PNG. If you’re using OS X or Linux, there’s a good chance Ghostscript is already on your machine. The last three tools are command line tools, and even Inkscape can be run from the command line (and in fact, inkscape_merge does exactly that). Don’t be afraid to try it out, if you’re so inclined. That’s how one gets more comfortable with the command line. Badges are made in Inkscape any way you want. You’ll have to have a separate file for each side of the badge, unless both sides will be identical. I draw my own crop marks for the printer in my document, put them in their own Inkscape layer, and lock it. Then I draw the rest. You can also do this after the artwork, but I like to get it out of the way at the beginning. If I want to show my colleagues what a badge will look like, I’ll make a selection of the printed area and use Inkscape’s “Export bitmap” function to make a PNG of it to show. Obviously, I’ve already consulted with the printer about what they need to receive from me before I even start. I’ve worked with printers for whom InDesign was literally the only option. We like our current printer. 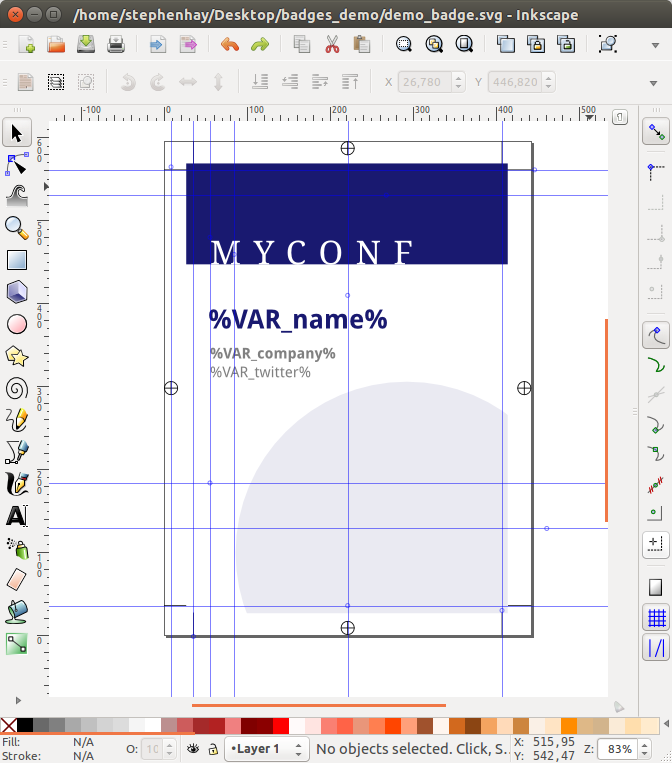 If I were to have a bit of text in my Inkscape SVG file with %VAR_name%, then when I run inkscape_merge with the above CSV file, that variable would be replaced with “Stephen”, “PPK”, “Krijn”, and “Martijn”, each in their own file. The CSV file should be UTF-8 encoded. Some weird bug I’ve been getting using inkscape_merge prevents me from changing the column separator to something other than a comma, which is the default. This is a pain, because sometimes you’ll have a field in the CSV that uses commas, like “ACME, Inc.”. The only workaround I have right now, since I currently don’t encounter many fields containing commas, is to create separate SVGs with hand-entered data for each row in the CSV that uses in-field commas, and convert these separately. It’s an awful workaround, but my last set of badges only had two instances, so no one dies. BTW, no, using double-quotes in the CSV doesn’t work, as inkscape_merge seems to skip rows containing them. Joy. First, make sure there’s a directory to put the batch input. inkscape_merge is going to create one file for each row in the CSV. This might be a lot. Let’s say that directory’s name is batch. Where sourcefile and datafile are the names of your SVG artwork and CSV file, respectively. The %d will be replaced, for each file, by the number of the CSV row. where sourcefile is the specific SVG file and outputfile is the name of the file you want to end up with. A little trick I use is to leave double-quotes around fields containing commas in the CSV. Since inkscape_merge doesn’t output these, I know which ones I have to do manually, and I also know how I should name them according to row, and these filenames are missing from the batch directory since they haven’t been generated. This will give you a bunch of PNG files instead of PDF. You’ll also have to export your infield-comma exceptions to PNG manually. A separate file is created for each row in the CSV file. Printers generally want PDFs, so whether our batch consists of PDFs or PNGs, we’re combining them into a PDF. Make sure you’re in the batch directory first. For more info and variations, see https://www.linuxjournal.com/content/tech-tip-using-ghostscript-convert-and-combine-files. The `ls` turns the output of the ls command into input for the gs command. You could also use * or $(ls) instead, in this case. If you’re in the batch directory, the output of ls is a list of all the files that we generated before. We’re limiting memory usage to 2MB here, because otherwise with many files, sometimes the system will kill the process because it’s using too much memory. That’s it! 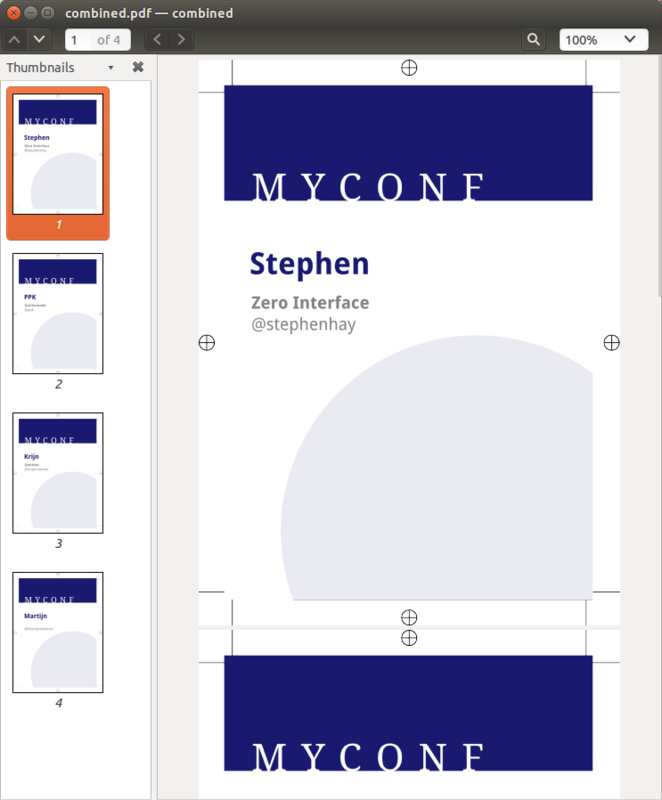 This is how we’ve been making most of our conferences badges for over a year now (except for one which involved HTML, CSS and PHP). The above process is pretty painless once you’ve run through it a few times, and generating a file with about 300 badges only takes a few minutes. Since SVGs are text, and inkscape_merge variables can replace any text in the SVG, you can customize colors per badge or practically anything else. You could potentially do any kind of scripting you like. And of course, you could wrap all of this in a tidy bash script for easy execution. I’m in the process of making a demo video of this workflow, in which I also demonstrate using variables for colors. This should be done in a day or two, and I’ll post a link here when it’s done!